When enclosing their properties, many homeowners strive to balance the need for security with the desire to maintain views of the surrounding scenery. In the Phoenix area, this is particularly true for homeowners whose properties face beautiful vistas of mountains, golf courses, or open desert. Wrought iron view fencing offers an ideal solution, keeping children and pets safely within the property (and unwanted visitors out!) while still allowing clear views of the surrounding areas. Regardless of the context in which it is used, wrought iron fencing is sure to enhance the aesthetic appeal of any property. Admired for centuries due to its natural elegance, wrought iron is beautiful on its own—but its malleability offers the additional advantage of allowing the wrought iron to be shaped to suit any style. 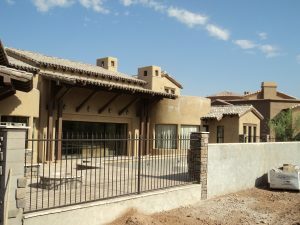 At DCS Industries, we routinely create custom wrought iron fences in styles ranging from sleek and contemporary to Southwestern to decorative and ornate. No matter the style, however, wrought iron fencing tends to have large enough spaces between its pickets to allow virtually seamless views of the surrounding areas. Of course, aesthetic appeal is not the only consideration when choosing a fence—even when installing view fencing, most homeowners also prioritize security and privacy. Fortunately, wrought iron view fences may include gates and solid wall portions to help shield the property from onlookers. In addition, wrought iron is highly durable, making it very difficult to climb, damage, or otherwise breach. 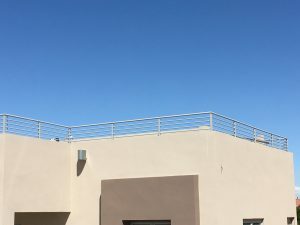 This ensures that the fencing will provide reliable security without distracting from the view. 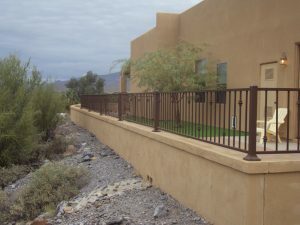 At DCS Industries, our specialties include designing, manufacturing, and installing wrought iron view fencing for residential and commercial properties throughout the greater Phoenix area. We work closely with each client to develop custom fencing and gate solutions, regardless of your unique style or needs. All of our wrought iron products are crafted with premium-grade steel and the highest quality components to ensure long-lasting durability and value. Additionally, we offer the option of galvanization, which refers to the process of sealing the wrought iron with a protective zinc coating. Our galvanized wrought iron products carry a ten-year warranty against rust and other types of deterioration—which is particularly beneficial for view fencing and other outdoor wrought iron fixtures that will be exposed to rain and strong sunshine! In need of stylish fencing to secure your property while maintaining the beautiful view? Contact DCS Industries today at 623-825-7700 to request a free estimate!